For the 24 hours to 23:00 GMT, the AUD declined 0.55% against the USD and closed at 0.7060. LME Copper prices declined 1.0% or $59.0/MT to $6148.0/MT. Aluminium prices declined 0.9% or $17.0/MT to $1848.0/MT. In the Asian session, at GMT0400, the pair is trading at 0.7076, with the AUD trading 0.23% higher against the USD from yesterday’s close. Overnight data indicated that Australia’s NAB business conditions rose to a level of 7.0 in January, following a level of 2.0 in the previous month. Furthermore, the nation’s NAB business confidence index advanced to a level of 4.0 in January, compared to a reading of 3.0 in the preceding month. On the other hand, home loan approvals recorded a more-than-expected drop of 6.1% on a monthly basis in December. In the previous month, home loan approvals had registered a drop of 0.9%. 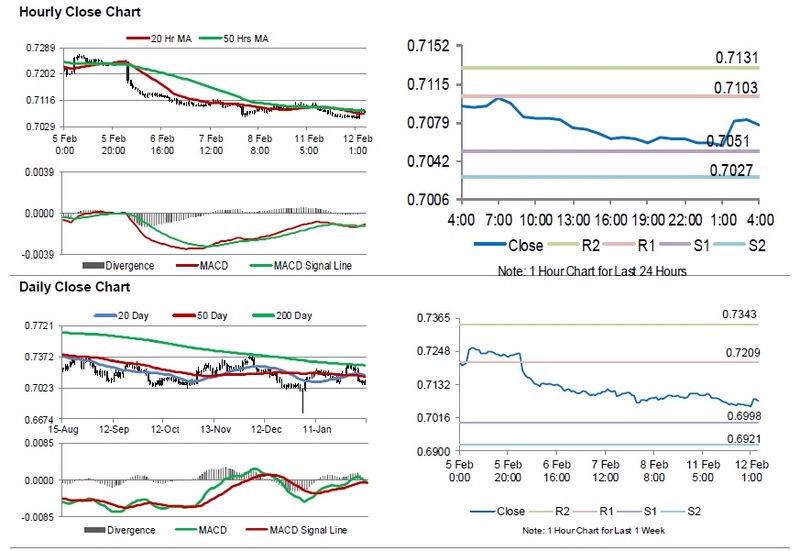 The pair is expected to find support at 0.7051, and a fall through could take it to the next support level of 0.7027. The pair is expected to find its first resistance at 0.7103, and a rise through could take it to the next resistance level of 0.7131. Looking forward, traders would await Australia’s Westpac consumer confidence index for February, slated to release overnight. The currency pair is trading above its 20 Hr moving average and showing convergence with its 50 Hr moving average.